Remember when an outdoor kitchen consisted of a barbeque, lighter fluid and a bag of charcoal? Times have certainly changed and today’s outdoor kitchens are planned with the same precision and detail as the indoor kitchen inside your home. IVY STUDIO LLC, based in Massachusetts, is a landscape design consulting firm where we design and build an expanded outdoor environment. Most, if not all of our designs incorporate outdoor kitchens as part of the design brief. To follow are some of the emerging trends in outdoor kitchen design and the expanding choices available for gourmet meal creation not just limited to the indoors. •	Functional zones- Just like the indoor kitchen is designed with functional zones to facilitate logical flow patterns, designing the outdoor kitchen in the same way yields to better form and function. Not to mention, enhanced aesthetics as well. This modern trend of creating outdoor kitchen and dining spaces necessitates careful planning of how the client intends to use the spaces. If truly outdoor entertaining is the goal, plan adequate counter space, storage space, table & seating space as well as the requisite appliance choices, which are now equivalent to those usually restricted to the indoor kitchen. •	Select materials wisely- No longer the cinder blocks with stucco and tile countertops of old, new outdoor kitchens are being built using a myriad of weather resistant outdoor materials. Stainless steel appliances and cabinets have long been the standard, but we are now starting to see the emergence of powder coated metal cabinets, popular because of color choices and durability. The powder coating technique also adds a sealer protection layer to repel corrosion when adjacent to salt from ocean or swimming pool and spa. These cabinets can even be coated with a specialized technique to make them look like real wood. •	Appliance choices- This is an area that has moved rapidly from the single barbeque to an expanding choice of appliance types, multiple fuel options and accessories to rival a Michelin Star restaurant! We sit down and have an in-depth conversation with our clients and understand their respective needs and how much or little they want to replicate form their cuisine indoors. We can then begin to select the appropriate appliances to match their culinary appetite. Today’s barbeques come with a bunch of options including rotisserie, warming racks, side burners and griddles. Also available are convection rapid heating elements, useful for year round grilling on the East coast. Smokers, open flame cooking as well as pizza ovens are gaining in popularity as appliance options in addition to a barbeque unit. Of course the choice of refrigeration units, ice makers and beer and wine chillers has also expanded in outdoor version offerings. Cooking prep areas are now common as well as built in disposal drawers and hot and cold water faucets fitted to large sinks made from beautiful materials to augment counter top materials. When designing outdoor kitchens, one necessity you can never have enough of, are built-in outdoor electrical receptacles for blender and other accessories used in the kitchen. •	Going undercover- A trend we see evolving is moving away from traditional shade covering of outdoor kitchens by umbrellas or trellises. These days, we are designing more outdoor kitchens as open air structures with a roof to protect from the elements like sun and rain as well as hungry and angry birds. By so doing, protecting expensive cabinets and appliances extend their longevity and creates a more pleasant environment to prep, cook and entertain. •	The whole deal- no longer just about the barbeque, when we design outdoor kitchen and entertainment spaces, we look past appliances, dining & casual seating, ceiling fans and more. We look at outdoor T.V. and entertainment systems, mood and accent lighting and accessories to compliment the décor. 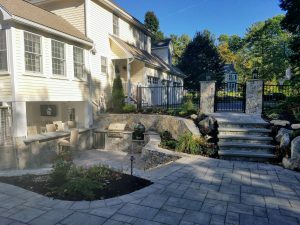 Contact IVY STUDIO, LLC at 781-591-0300 or vern@ivystudioMA.com to learn how we can transform your outdoor kitchen ideas to an epicurean delight.